With over 20 years of experience in the banking and finance industry, Monica Coburn is currently a Senior Vice President of Commercial Lending for Mutual of Omaha Bank, and has held various positions within the industry including SBA Lending Manager overseeing offices in Nevada, Arizona and southern California, and a Regional Manager for a global finance company. Monica has received numerous awards throughout her career, including awards from the U.S. Small Business Administration, a recipient of the Woman of Distinction Award by the National Association of Women Business Owners, the Presidential Award from the Obama Administration for her volunteerism and in 2018 an award from the Urban Chamber of Commerce for Women In Politics and Community Service. 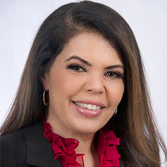 Monica has participated as a speaker and panelist speaking on access to capital and business financing for various business workshops and serves as a guest expert and mentor for the Emerging Leaders Program, administered by the U.S. Small Business Administration. In 2017, she co-founded a locally based women entrepreneur group called POWHer of WE, with the mission and purpose of educating and empowering women business owners through valuable resources and connections. Monica’s passion is helping businesses succeed and helping the youth in our community who need it most. Her community involvement includes her volunteer efforts with a number of charitable organizations including Salvation Army, Nevada Partnership for Homeless Youth, Goodie Two Shoes, Project 150, and Three Square. She also serves on the Board of Directors for several organizations, including Nevada Business Opportunity Fund, B.E.A.S.H.E.R.O. Foundation, Global Charity Foundation and was recently appointed by the County Commissioners as a member of the Business Development Advisory Council for Clark County. Previously, she served on the Board of Directors for Dress for Success Southern Nevada and was the founding chair for their annual signature event.